Expressways are rural or urban arterial roadways with controlled access. They are intended to provide a high level of safety and efficiency in the movement of a significant volume of traffic at high speed. Control of access refers to the regulation of public access rights to and from properties abutting the roadway. With controlled access, preference is given to through traffic while ingress and egress to adjoining properties is only permitted at specific locations such as public roadways. This access is normally provided through the use of at-grade crossings. In certain situations, access to adjoining properties can be provided through the use of frontage or backage roads or by restricting movements to a specific entrance (i.e. right-in and right-out). The principal advantages of controlled access include preservation of roadway capacity, higher speeds and improved safety for the roadway user above the levels provided by a roadway that permits entrances to the roadway as necessary to provide access to adjacent properties (additional information can be found in Access Management Guidelines). 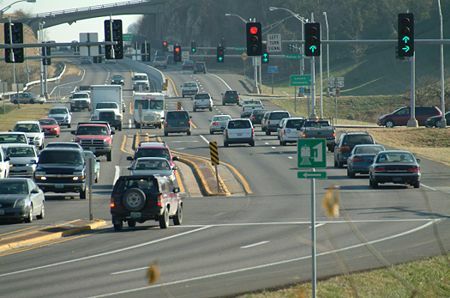 Essential expressway elements include the roadway, medians, at-grade intersections at crossroads (with or without traffic signals) and in some cases frontage roads (typical sections are available). This page was last modified on 3 August 2010, at 15:13.